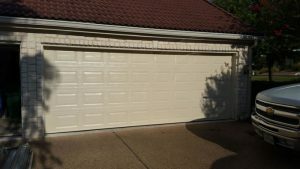 We specialize in garage door replacement and new garage door installations of top quality garage door brands and reliable, innovative Liftmaster garage door opener systems. Call our family-owned garage door company now at 281-252-3346. Immediately talk with an experienced garage door technician to get your questions answered about our many style, colors, and materials options. We make choosing a new garage door system or designing a custom garage door easier! Whether installing a new set of beautifully finished decorative doors or a basic overhead garage door system, our team of garage door specialists will help you find a solution within your budget. Whether you are building a new home, shop, or garage or replacing an old garage door, our professional garage door technicians can help you select the right door system. And our trained technicians will install and maintain it for years of convenience, security, and good looks. The key to hassle-free garage door ownership is properly sizing the garage door and the opener that will operate it. Ask our technicians about convenient, state-of-the art WiFi-enabled systems that put opening and closing of your garage door at your fingertips on your phone no matter where you are. No more worrying wondering if you left the garage door open! We offer garage door installation of top quality brands including Amarr, CHI, Wayne Dalton, Clopay, and Genie. We install Craftsman garage opening systems because they have the best warranties and workmanship in the industry. Why Choose Us for Your Garage Door Replacement or New Installation? 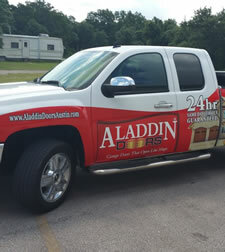 Aladdin Garage Doors is a garage door company serving Houston and the surrounding area. We specialize in the sales, installation, service, and repair of garage doors in both residential or commercial buildings. When you choose us, you get the friendly service of a small, local, family run company and the professional service 24/7/365. Whether you need to install garage doors in a newly built home, want to do a garage door replacement, or are outfitting a storage facility with dozens of new doors, we can provide an installation package to meet your budget, style, and needs for durability. 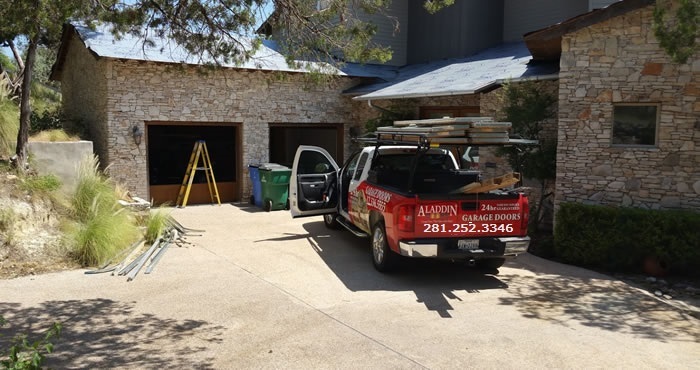 Call 281-252-3346 or fill out our contact form at right to schedule a convenient time for a technician to provide a free estimate for your garage door installation.